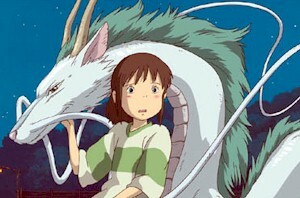 The Skinny: One of the best films Studio Ghibli has ever produced (and the highest grossing Japanese film of all time). After the slightly disappointing Princess Mononoke, Miyazaki returns with this terrific work that seamlessly mixes twenty years of great technical innovation, charming characters and weird plot developments. Anime at its best. by LunaSea: There's no need to introduce Hayao Miyazaki, or Studio Ghibli for that matter. They've revolutionized the anime industry in the last twenty years with outstanding productions and uncompromising, intelligent stories. Miyazaki's career has evolved a lot over the years. Since his start in television (the old Heidi series), his talent has been evident. It was with his Lupin III film, The Castle of Cagliostro, that Miyazaki found his rhythm. Still one of the most entertaining and stylish anime of the last thirty years, that film showcased a sense of pacing, storytelling and animation that would change the industry forever. Some of the more impressive recent hits (like Cowboy Bebop) owe a great deal to Miyazaki's work with Lupin. Miyazaki's greatest talent is the ability to translate onto film just what it means to be a kid. He creates fantasy worlds that appeal to us because they're very similiar to the worlds we dreamed about in our childhood. His best films also tackle serious themes, almost watering them down with simple stories and playful characters. Still, it's always a pleasure watching any of the master's works, because it's like going back in time and rediscovering the innocence, creativity and spontaneity that we might have lost while growing up. Works like Porco Rosso and Castle of Cagliostro are departures from the "twelve year-old heroine dramas" that Miyazaki is famous for, and they highlight the director's talent to merge serious themes with simplicity. In similar fashion, Spirited Away comments on what it means to grow up in today's Japan, and doesn't hammer its message into you. The film unfolds smoothly, and when it's over you almost fail to realize that this simple tale of ghosts, bath houses and weird monsters is actually a very intelligent commentary on the challenges kids face growing up. An energetic ten year-old girl, Chihiro (voice of Rumi Hiiragi), arrives at a weird tunnel with her family. Past that, they find a village. It's a deserted place, though many stores are open, and hot food is on the table. Where has everybody gone? While her parents don't waste any time and start to stuff themselves, Chihiro decides to explore the town a little more. Imagine her surprise when, returning to check on her parents, she finds out they've turned into pigs! Moreover, she's been cut off from her former world and stranded in this bizarre new one. This new world doesn't allow humans unless they give up their name and start working for the local bathhouse's head honcho Yu-baaba (Mari Natsuki), a greedy and ruthless witch. Chihiro becomes Sen (Chi and Sen use the same Kanji. Upon entering this world, you must sacrifice your identity to the boss, even if you still have your memories. Hence the similar name. ), and starts to integrate into this new society. However, she discovers the problems it's suffering. There's a sense of hopelessness on many people's faces, and step by step (and mistake by mistake), she tries to give them hope through her actions. The biggest charm of this film is how every character is interesting, from the various bathouse attendants to Yu-Baaba's giant baby. You're transported into a different world by Miyazaki, who creates a sense of familiarity and somehow makes it all work. For those who feared the digital era would change anime negatively, fear not. This film simply looks stunning, from the simplest details to landscapes and water. Also, the integration between traditional cells and CGI is seamless and more impressive than ever. Joe Hisaishi's score keeps a nice balance between the epic feeling of Princess Mononoke, and more relaxed fare like Porco Rosso. It's never intrusive, and carries you along for the ride in a remarkable way. Notes: As mentioned recently on many message boards, the Region 2 and Region 3 DVDs feature a slightly reddish tint. Despite Buena Vista and Ghibli's statements that the disc is not defective, there has been noticeable fan unrest. However, you can easily solve the problem by manipulating your TV's color saturation and hue to achieve your desired color settings. And on small and medium sized TV sets, the problem is barely noticeable.